When searching for the perfect college or university, prospective students may choose to search outside of their comfort zone and explore other countries around the world. Though more common locations are spaced throughout Europe, a viable choice for studying abroad in New Zealand. Located in the South Pacific to the southeast of Australia, New Zealand is composed of two main islands, with several smaller surrounding islands. The two largest islands are known as the North Island and the South Island. Before choosing to study, students should be aware of foreign climate and landscape. At the moment, most people around the world know New Zealand's landscape from the Lord of the Rings movies in the early 2000's (some believe this caused the push to study abroad in the country for the younger generations). The climate of the country varies throughout; northern areas are typically mild, sub-tropical through the year, while the southern end of the country remains cooler. Overall, students looking to study in New Zealand should be aware that most of the country has a "wet climate" from constant changes in the weather; when looking to study internationally, students should always be aware and be prepared by bringing necessary items for the climate. Another major issue that prospective students should be aware of is the change of currency. In the present time, the U.S. dollar is equal to 1.48 New Zealand currency. International tuition and scholarship opportunities can vary for each university; each school states their total costs on admissions pages on their websites and, if scholarships are not offered, typically provide links to outside scholarship pages. Depending on each university, the housing can be provided, or assistance can be provided to find outside residences. Typically the average cost of living in New Zealand can vary from NZ$12,000 (about US $8,400) to NZ$15,000 (about US $10,500) per year; the cost includes housing, food, and travel. For international students, there is an international studying fee added on to the total tuition; this fee changes per each university and should be checked on each site. Between the two islands, there is a total of eight possible university options, all offering the admission of international students for both short-term and full college experience. 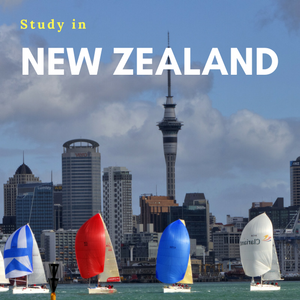 Most programs of study are provided in New Zealand, though not at all universities; larger schools obviously have more options, while smaller universities offer a more focused education in specialties and specific areas of study. To determine if certain desired programs are offered for study, students should check with university websites to guarantee that their program is available. All eight universities offer online application submissions. However, unlike the general application for schools in the U.S., each university has an individual application that needs to be filled out. Each application requires transcripts from previous educational experiences, resumes, and proof to meet the English language requirement. International students can prove their language requirement through the International English Language Test System (IELTS) by meeting the required score for each university. Located in the heart of downtown Auckland. Offers Master of Engineering programs in BioEngineering Chemical and Materials Engineering, Civil and Environmental Engineering, Computer Systems Engineering, Electrical and Electronic Engineering, Engineering Science, Mechanical Engineering, Software Engineering. MBA degree cost for international student might range from 33,000 to 55,000 NZD. Offers programs in Mechanical, Electrical, Computer, Chemical, Civil, Environmental Engineering and Computer Science. Located just outside the heart of downtown Christchurch on New Zealand's South Island. The University of Otago has top eight quality rankings as released by TEC. Offers programs in science, math and health related degrees. Less than one mile from the steepest street in the world. Widely regarded by students as the best college town in New Zealand. Auckland: The City of Sails, as it is known, counts more boats per capita than any other place in the world. From hosting America's Cup to the hundreds of sailing ships, water taxis, and ferries, Auckland's connection to the water defines the city. Not only is Auckland surrounded on all sides by bays, harbors, and the ocean, but the city also is ringed by seven volcanoes and miles of beaches-- making it a spectacular setting. Once prospective students choose their university and desired program, they should begin the process of applying for a student visa. To study for longer than three months in New Zealand, students must get an international student visa for studying abroad. To get the student visa, prospective students fill out the applications found on either university website links or their country's immigration department. Once approved, send proof to the university of choice and wait for the final approval.